When an undersea volcano erupted this past May near Samoa, researchers captured video of the blast. Now they've released the footage, giving the rest of the world its first look at the deepest underwater eruption ever caught on film. 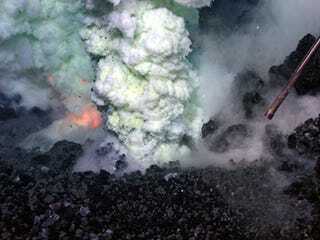 The West Mata undersea volcano, located 200 kilometers from Samoa, erupted in May. Researchers with the National Oceanic and Atmospheric Administration sent the remotely operated underwater vehicle Jason to record the explosive action. In addition to tossing up lava and chunks of rock, West Mata also released a significant amount of sulfuric acid into the water, rendering its acidity somewhere between battery acid and stomach acid. The research team collected various samples and is analyzing them and the footage to better understand these deep sea eruptions and the life that exists around these deep underwater volcanoes. Meanwhile, we get a spectacular view of the eruption itself.